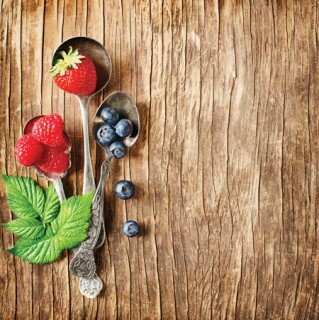 Berries battle chronic disease and aging while prolonging mental sharpness, according to new Annals of Neurology stats. Here, our top reds and blues. These deep-purple berries are of interest to scientists for their high levels of phytonutrients, and even have a higher amount of antioxidants than their cousins, blueberries. Found in the heartland of North America, the aronia berry bolsters memory and cognitive brain function. This beloved berry may be the star of countless tea parties, but how much is known about its nutritional value under all the whipped cream? Strawberries are an excellent source of vitamin C and prove quite exceptional in the antioxidant arena. They’re a powerful one-two punch: delicious and nutritious! Research shows that fl avonoid-rich berries, such as black raspberries, are known to help reduce the risk of colon cancer. Raspberries are also excellent for weight management, as they’re rich in insoluble fi ber. (This helps with the feeling of fullness.) Packed with vitamins C and K, this succulent and colorful berry is universal around the globe. If you experience urinary tract infections, add these tart, red berries into your diet. A cup of cranberries actually has a higher diseasefi ghting antioxidant capacity than virtually all other fruits and vegetables.